"I can’t think of a more meaningful way to take part in political discourse." Seven SJU students joined 350 others from colleges and universities spanning the country for The Washington Center for Internships and Academic Seminars’ Democratic and Republican National Convention programs in July. 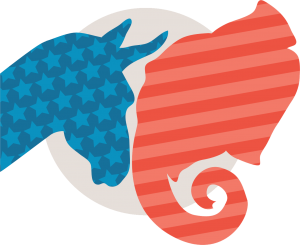 Two-week sessions were held in Cleveland for the Republican National Convention and in Philadelphia for the Democratic National Convention. Through academic partnerships with Temple University and Baldwin Wallace University, students attended guest lectures led by prominent political leaders and scholars and then volunteered on the convention grounds. Five students attended the Democratic National Convention seminar in Philadelphia, including political science major Christina Ciconte ’17. “The best part of the program was my placement in the building allowed me to hear all the speeches for four days and encounter many politicians walking to their seats,” she says. Political science majors Max Barrile ’18 and Matthew Slavoski ’17, as well as history majors Julian Chalifoux ’17 and Matthew Sibona ’18, also attended. “The conventions give students an insider’s perspective on the political process and a front-row seat to history,” says Washington Center President Mike Smith. “This seminar is an immersion into the campaign world, giving students numerous opportunities to study the nomination process from start to finish. I can’t think of a more meaningful way to take part in political discourse."